PROVEN MODEL. NATIONAL REACH. LOCAL FOCUS. SELECT A MARKET TO MEET THE TEAM IN YOUR AREA. HEALTH CARE SOLUTIONS SCALED TO FIT YOUR NEEDS. Our Scalable solution has proven results across geographies and patient populations. But we don't take a "one-size-fits-all" approach. We recognize that no physician, practice or market is the same, and we customize our approach based on the unique needs of our partners. VillageMD is headquartered in Chicago, Illinois. We currently partner with primary care organizations in Chicago, Houston, Indiana and New Hampshire. We are continuously developing new provider partnerships to expand our footprint across the U.S.
Find out how VillageMD can help you practice medicine the way you've always wanted. VillageMD is expanding. We have a goal of supporting 5,000 primary care providers by 2019.  We are currently developing new markets throughout the country. Put your practice on the map. We may be exploring options in your area, and we encourage you to contact us to learn more. WANT TO PUT YOUR PRACTICE ON THE MAP?